You are here: Home » What We Feed Our Kids Matters! Do you see what I see? The summer days are turning to back to school days. It can be a bit overwhelming to get into the swing of things again. Make it easy on yourself and get back to school in style with some simple, healthy school food choices. Try school lunch! School meals are affordable, convenient, and healthy. 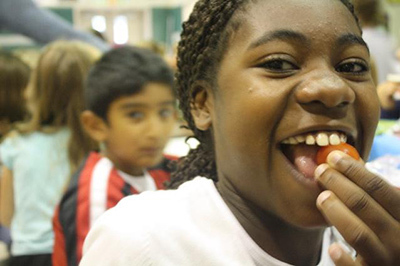 When your children get school meals, you support the school food service program’s efforts to continually improve the quality of school food and provide food education opportunities for all students. Be sure to check if your students are eligible for free/reduced price meals. Forms are available on your school district’s website and signing up is easy. Create simple, healthy lunches kids love – For families packing their own school lunch, here are some fun and healthy Back to School Lunch Ideas. Promote healthy eating in school cafeterias as parents, school staff, community members and volunteers. To sign up to volunteer in the cafeteria, classroom, or school garden, click here. Keep it simple while feeding your students’ appetite for healthy food. It’s a great way to start the school year off right because what we feed our kids matters!